"I'm going to take my iron and ironing board to hen party tonight," I said. "We have to iron all of Emily's chair covers and lavender sashes for the reception!" I replied. We all pulled into my mother's driveway separately but all of our cars contained the same items, an iron and an ironing board. We set them all up next to the six pronged outlet in the living room. We waited for the irons to heat up and then we began. Chipper at first we talked, gossiped about the beauty of the color lavender, and ironed. Our arms worked at a feverish pace. My girls worked in a corner to unwrap each piece of fabric, stacking them by the multiple ironing boards. We laughed about the hilarity of four ironing boards sitting in one room. What if someone could see into my mother's living room? What would they think was occurring inside this house? After about two hours of continuous ironing we broke and dished out ice cream, strawberries, and shortcake. We sat, careful not to spill, and relaxed during our dessert break. My grandmother complained about her back hurting, my aunt about her foot, and I just kept ironing. We found the style channel on TV, watching "shallow" TV so that we could concentrate on our job. At 10:30 p.m., four and a half hours after starting we began to get silly. 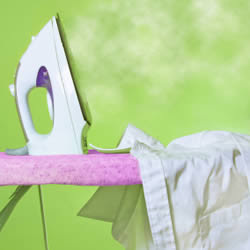 Noticing any time that someone set their iron down. We counted how many pieces were left to iron, the task becoming daunting. Still, we continued to iron. We unplugged our irons, collapsed our boards, loaded up and headed home...to our beds. Finished? Not exactly, but close. We will finish this week, in the evenings, until Thursday when they will all be collected and taken to the reception hall. This slice of life was work, hard, hot, satisfying work. Last year I became very disappointed with my workstations. I just didn't feel like my kiddos were doing anything but playing around during their "work" time. This year we have a new basal series and so throughout the week I have been looking through materials. I am not a huge fan of any basal but I do use it for shared reading, I use it to pace my phoneme skills, and this series has a testing strategy for each unit. Since my kiddos are getting ready to take the state test I figure it wouldn't hurt them to learn some of the strategies they will need. -Two verbs, walking and sleeping, can you think of as many synonyms that go with these words? -Here is a sentence with the missing verb, replace it with your own. -Here is a popular poem with some words taken out, replace them with your own. -Here is a simple sentence, now you may describe what it is that made it this way. Here is the sentence: It was the perfect day. -This piece of writing is missing the quotation marks, can you rewrite it so that the quotation marks are in the right place? -Look through these books and make a list of different ways that writers write that someone is speaking. Instead of: The girl said, " what could replace "said?" -This poem has a lot of alliteration, I describe the meaning of alliteration and then they must come up with their own! -This is an idiom, can you tell me what it means? -Find the simile and tell me what the item is being compared to. So, I am also placing some information that is about grammar within this workstation too. I am hoping that my kids will stay busy, and they will learn some stuff that they can use later in writing. We'll see, I hope that it is a little more productive than last year. We are moved when we realize our decisions in the classroom teach students to think of themselves as particular kinds of people. But we realize that all teaching does this. If we told students what to do all day long, we'd be teaching them to think of themselves as people who should wait to be told what to do. So we embrace the people we ask them to become, people who make books, and we teach and teach into this essential identity." Now the work of teaching teachers this way. I think there is a group of teachers out there who still believe that teaching is about dumping information in and spitting outcomes out. 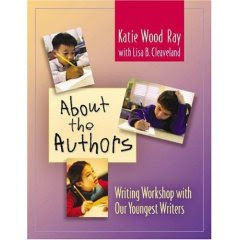 If we read work by Katie Wood Ray, Debbie Miller, and Piaget we begin to understand that teaching is about guiding, showing through example, and the chance for discovery. If we can begin to establish classrooms in this way then we will begin to see results. 1. I love potato chips. I like all flavors, even salt and vinegar. They are my nemesis and I could eat an entire bag of them. If I have to take a snack somewhere, then I love to take chips. Since my dieting however, I have been trying to just stick to pretzels. I like those, but not as much as chips! 2. I have a routine in the morning, if I don't do the routine then I am all thrown off for the day. It goes like this: shower, contacts, hair gel, tooth brushing, moisturizer, blow my hair dry, make-up, apply body lotion, get dressed, put on wedding ring. It's the OCD in me I know. 3. I have always been alone. Since I was a child I have been a loner of sorts. I was an only child, I enjoyed playing alone, I lived alone in college, I go shopping alone. Now that I am married and have children getting to be alone can be a challenge but, I long for it. I long for solidarity. If I could spend a week alone I could do it. I am alone and never lonely, just like Sydni. 4. Anything having to do with teeth terrifies me. When people talk about their root canals, or children show me their loose teeth, it all grosses me out. I went to the dentist twice last year, prior to that I hadn't been in 9 years. I had perfectly fine teeth and didn't even have that much plaque! I hate anything that has to do with teeth. 5. I am learning more and more about loving the human race, not just Americans. I am learning that everyone wants to live the American dream (it doesn't always have to be in America, I just mean figuratively the "American Dream"), that we all want what's best for our children, and we want to just live and die happy. My world is getting smaller and I am liking all that I am learning. 6. Someday, in my lifetime, I don't know when, how, or why, but my heart is calling me to adopt a child from Africa. I am hoping for a boy, but a girl would be fine as well. I am hoping for someone who has HIV, or has lost their family to HIV, or just someone who needs... us. -list 6 random things about you. -link back to the person who tagged you. So, yesterday I saw my aunt's son marry a beautiful young girl. Dating for more than 4 years the happy couple today is boarding a plane to Hawaii to honeymoon. Weddings always make me nostalgic and this wedding made me feel old. I was only 11 when he was born and obsessed with babies. My aunt had me come and spend many weekends to help her care for her newborn. I rocked him, changed him, and sang to him. It was an odd feeling watching him walk down the isle. My girls performed a task in the wedding that I had never heard of, they were bell ringers. They announced to the congregation that the ceremony was about to start. They started on each side, walk to the front and then together, up the middle. Yesterday, I took Sophie to get her hair done. They looked magical! I was so proud of them and their beauty, inside and out. Magical weddings are, they are a culmination of all we have worked so hard to accomplish in our children. But, it is also the start of something new, a new life. Leaving the wedding yesterday I walked to our car with my two lovely children, my husband of 11 years, and inside my heart was full. Looking at my life, I realize how truly blessed I am. Another exercise I used was to write from another person's perspective. You are my little one, my pride and joy. your belly fully satisfied you rested, safely. I have been trying many of the activities in Aimee Buckner's book just for myself as a writer. I have to tell you that I dig living the writerly life! I started with an activity where you take a noun and just write as much as possible about that noun. I reread some of my former notebook, another idea in the book, and found the word bird. I love birds, and I thought, I want to write a whole page about birds. This was easier than I thought! Aimee says to write anything, and if other things lead from that topic it is okay. So I began my piece about birds. Meaningless at first, I began to see the poetry of words coming together, I want to reread and highlight soon this one piece and change it into a poem about birds. So, a meaningless topic has been the seed to a poem. Next, I was just doing some writing about a childhood memory. Aimee Buckner says that the start of writing with children in her classroom is through oral storytelling. My children and I were driving to the pool yesterday and Sophie asked me about my deceased grandfather. I began telling her that I have a lot of really great stories I could tell about him, as he was such a vital part of my life. I began telling her the story of family reunions and his watermelons. That oral storytelling led to me writing a piece about that memory. I can't wait to share these workshop ideas with my kids this year. They will catch on fast I know, they are such great writers. I know that having these personal writing moments myself will encourage them that even I can do it! Kids love the fact that teachers write themselves! Today, Sophie got her notebook out and wrote about flowers. She noticed that my notebook is filling up with all kinds of words. I read some of it and mentioned the noun activity. She said, "Can I get my notebook out and try that?" Well, duh, yea... I pressed her to pick a topic that she can write a whole page about. "I want you to fill the whole page!" Daunting it seemed, she began her piece about flowers. At first, it was about me planting flowers, how she gets to help, then it turned to labeling the parts of a flower, and then planting a seed, and growing a flower. So what could this piece become? Lately I have been reading Notebook Know How by Aimee Buckner a book that has been on my shelf for at least two years. When our facilitator gave it to us she said that she thought it would be for older students and I didn't read it. Wow, I wish that I had read it and at least tried some of the great ideas within it for myself. One of the first things that Aimee tries to stress is the importance of the notebook. She gives many quotes from the greats, Fletcher, Caulkins, Graves, etc. One of the greatest things that I am coming to understand is the importance of writing everyday, something, even if it is just a small happening. She says, "Interview after interview, book after book, writers talk about having a place to write every day... The concept is the same- to have a place just to write... a lot." She goes on to discuss that her first notebook she wrote a lot, and she seemed to think that there was not significance to what she was writing. This is how I feel a lot of times about my own writing. There doesn't seem to be anything significant to what I write about, who will really care. She began to notice though that as she wrote she began to get further away from diary like writing because she was revisiting, revising, and being a fluent writer. You see just from overly writing she began to notice things she could pull out from that mundane writing and turn it into something extraordinary! I am thinking that that is the key to the notebook, we must encourage students to write even when they think they have nothing to say, to go back and revisit, and then write from those seeds. Vicki Vinton says, "It is an illusion that writers live more significant lives than non writers; the truth is writers are just more in the habit of finding the significance that there is in their lives." I am making a commitment to write everyday, at least something, even if at the time it is insignificant. I want my students to know how writing mundane can translate into the seed of something bigger later. So, adios, I am off to write...a lot!